Beauty experts talk all the time about anti-aging skin care routines for the face and neck, but how often do we give hands the TLC they deserve? We know, the thought of a hand care routine might sound a bit indulgent, but it makes sense when you consider that hands are one of the first spots to reveal your age. Whether you’re hoping to avoid aging hands early on or are simply looking for ways to turn back the hands of time, TODAY Style enlisted several skin care pros to help you nail your anti-aging hand care routine in no time. They’re breaking down the most common causes of aging hands — and sharing a few tricks for keeping your hands forever young. The first part of establishing an anti-aging hand care routine? Recognizing the huge role sun exposure plays in the aging process. “Cumulative sun exposure over many years can lead to brown sun spots, irregular pigmentation, thinning of the skin and wrinkles,” said Dr. Allison Arthur, board-certified dermatologist at the Sand Lake Dermatology Center in Orlando, Florida. Regular sunscreen application can obviously protect you from sunburns and skin cancer, but it can also do a pretty solid job of shielding your hands from the aging side effects of the sun. Sadly, though, hands can sometimes become an afterthought when you’re focused on covering the rest of your exposed body in SPF. You might not intentionally forget to protect your hands with sunscreen, but doing so clearly has cumulative aging effects. And even though many of us are seeking the best hand cream for aging hands, it seems like good old SPF just might be the best solution of all. What else causes aging hands? Sun exposure is responsible for its fair share of aging, but UV rays aren’t the only reason your hands might be looking a bit less youthful. “Hands are exposed to wind, rain, work, sun and water, and as a result they age faster than other areas of the body,” said board-certified dermatologist Dr. Ellen Marmur. Routine daily habits like frequent hand washing, doing the dishes, cleaning with certain chemicals and forgetting to apply hand cream can seriously dry out your hands — and set the stage for aging later on. Certain medications, medical conditions or hereditary factors can also be responsible for thinning skin on your hands. And let’s not forget one of the most obvious causes of aging hands: aging itself. “As you age, the elasticity of the skin on your hands as well as the abundance of collagen begins to dissipate, making the skin on your hands look and feel more fragile,” said Amos Lavian, founder and president of Dermelect Cosmeceuticals. It also doesn’t help that your hands are on full display most of the time, meaning others can easily notice changes in their appearance. Facial serums and anti-aging moisturizers have become a regular part of our skin care routines, but how many of us have hand cream for aging hands in our beauty cabinet? Sure, we may amp up our moisturizing game in the winter when cracked skin abounds, but we don’t exactly have a dedicated anti-aging hand care routine. Just like the skin on our face and neck, the skin on the back of our hands has its own unique set of needs. “The hands have fewer sebaceous glands than the face. Sebaceous glands produce sebum, an oily substance that helps to protect the skin by keeping it lubricated and waterproof. This lack of abundant sebaceous glands makes the skin more prone to dryness,” Arthur said. And when you think about it, you use your hands for just about everything — cooking, cleaning, typing, exercising, etc. — so they really do deserve a bit of extra TLC. “It’s never too early to start an anti-aging hand routine. Just like your face, your hands need to be well taken care of in order to protect them against visible signs of aging,” Lavian said. 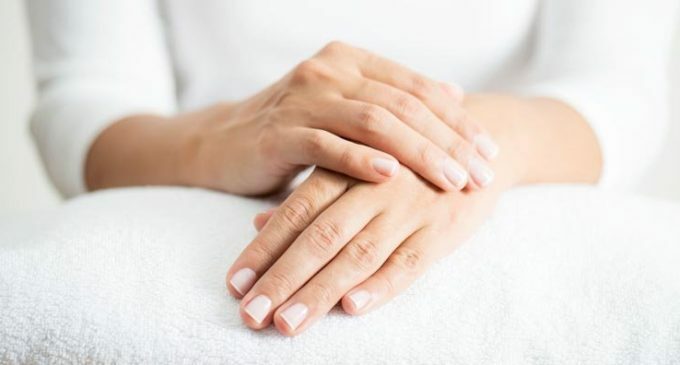 There are plenty of simple ways to slow down the inevitable signs of aging hands, and your routine doesn’t have to be over the top. “As a rule, I tell patients to simply use their anti-aging facial regimen on their hands. So, use a sunblock with UVA and UVB protection and if desired, a good antioxidant,” said Dr. Ranella Hirsch, a dermatologist based in the Boston area. Apply sunscreen to the back of your hands and don’t forget to reapply! “My favorite sunscreen to use on my hands is Colorescience Sunforgettable, which is a brush-on powder sunscreen that contains zinc and titanium. It is easy to use when you are on-the-go, and not greasy or messy,” Arthur said. Switch up your moisturizer at night: “For evening, opt for a protein-rich hand cream formula with ingredients like hyaluronic acid (to help plump up thin skin), emblica (a natural skin lightener to aid in the correction of age spots), soothing extracts or essential oils (for extra hydration) and a formula that is water-reactivated so that you don’t have to constantly reapply,” Lavian said. Seek out the best hand cream for aging hands: Look for a hand cream that contains ceramides, molecules that help to form a protective layer and retain moisture. If you are working on a computer or handling papers during the day and don’t want your palms and fingertips to feel greasy, squirt a dollop of moisturizer on the back of one hand, then rub the backs of the hands together. This avoids getting any cream on your palms. My favorite hand cream is EltaMD So Silky Hand Creme,” Arthur said. Try different treatments for aging hands: “I suggest using a mild exfoliant on the back of your hands once a week to help slough off dead skin and allow your SPF and moisturizer to seep into your skin better,” Lavian said. Go the extra mile: “If you live in a dry climate, like Arizona, or live in an area with extreme temperatures in the winter (hello, New England! ), I recommend taking an extra step of applying a luxuriously hydrating hand cream to the front and back of hand at night and putting on a spa glove for an hour, once a week. It may sound silly but this will create a spa-like treatment and impart extra moisture on your dry hands,” Lavian said. Cover things up: ”Consider ultraviolet protective gloves (like these from Bloxsun) for activities such as driving in the car, going for walks and bike riding.